Discovering countless duplicate files is something almost every Mac user is faced with. If you are a music lover, you may be downloading dozens of songs from iTunes every day. If you are a photographer, you transfer hundreds of photos from your photo camera or smartphone to your Mac. It may also happen that you copy documents, folders, archives and other files by accident, and forget to delete them. No matter how accurately you keep your files on the computer, as practice shows, most people cannot imagine how much disk space they lose because of duplicate files. Luckily, this problem can be easily solved with an application Duplicate File Finder. Moreover, we have prepared for you cleanup tips that will help to make the duplicates cleanup process as easy and fast as possible. 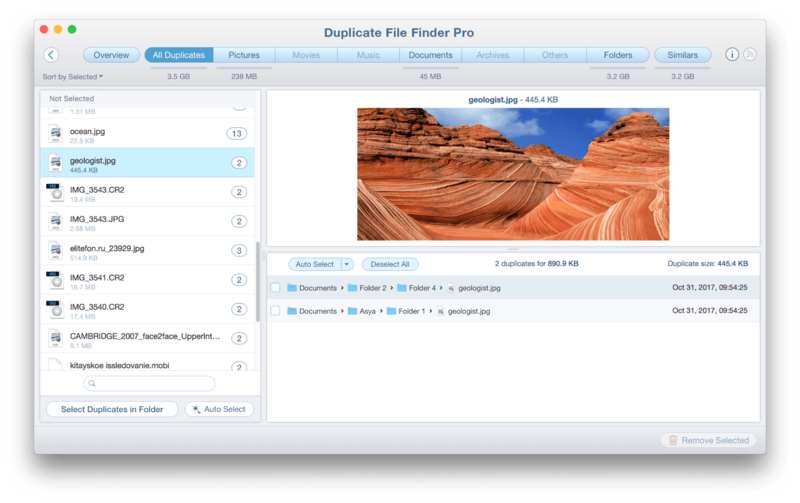 Before learning about the promised tips for using Duplicate File Finder, let’s take a quick look at the application. 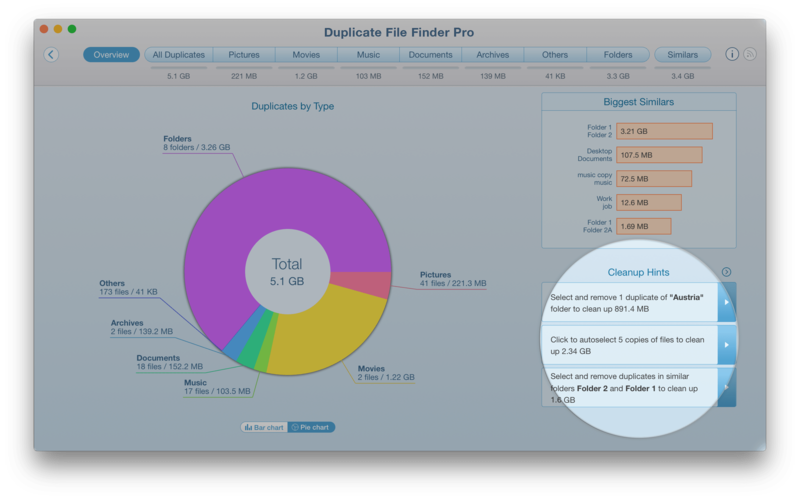 Duplicate File Finder helps check your Mac for duplicate files. It is free to download and can be used as a duplicate music files finder, duplicate video finder or scanner for any other identical docs and folders. 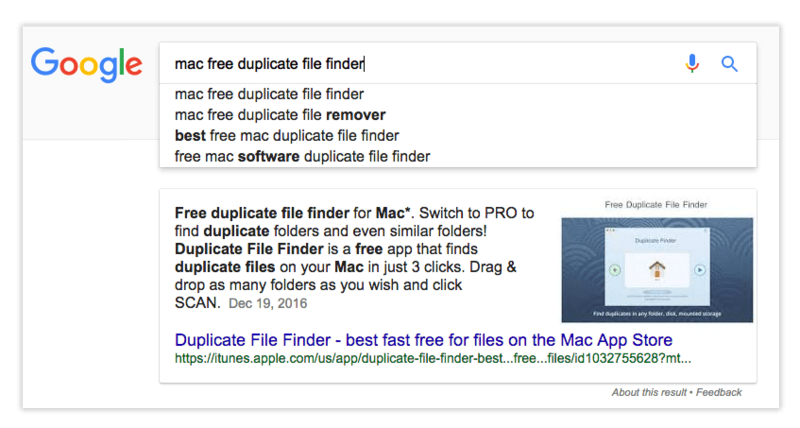 Even if you ask Google what is the best free duplicate file finder, you will get the same response. 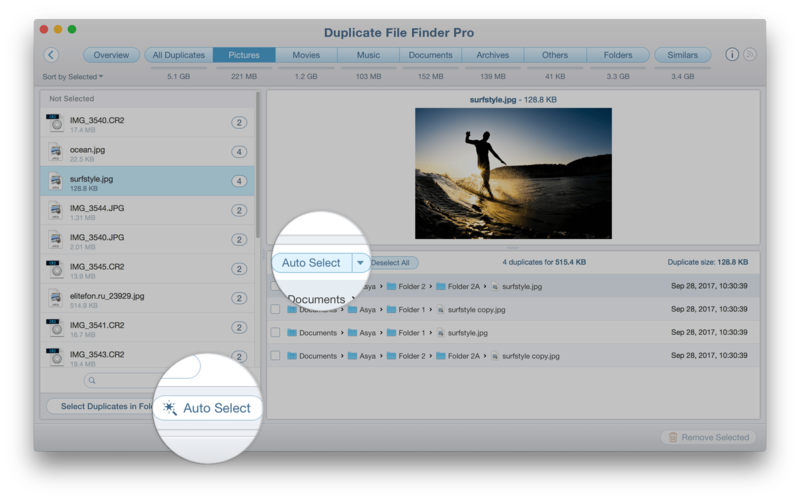 When you launch Duplicate File Finder, you will be amazed at how intuitive its interface is. It’s so easy to find identical files. Drop the folders or drives you want to check, and click the Scan button. Select the iterative files and click Remove Selected. If you have a huge number of duplicates, you may be confused as to how to select them. But don’t worry, there are some useful features that will make your task easier, faster and smarter. In the Overview tab you will find smart cleanup hints that suggest which duplicates should be removed and which ones should be kept. Use these tips when you are not sure about your initial duplicates. 2. Use the Autoselect button. If you’d like to select the duplicates automatically, use the Autoselect button. Read in our previous article how to operate the Autoselect option. This feature will be helpful when you have several folders with duplicates and you know exactly from which folder you want to remove files. So you don’t need to review each file separately. Autoselect will do it for you in just one click. 3. Sort your duplicate files. If you need to quickly free up some space on your disk, you can use the “Sort by…” option. 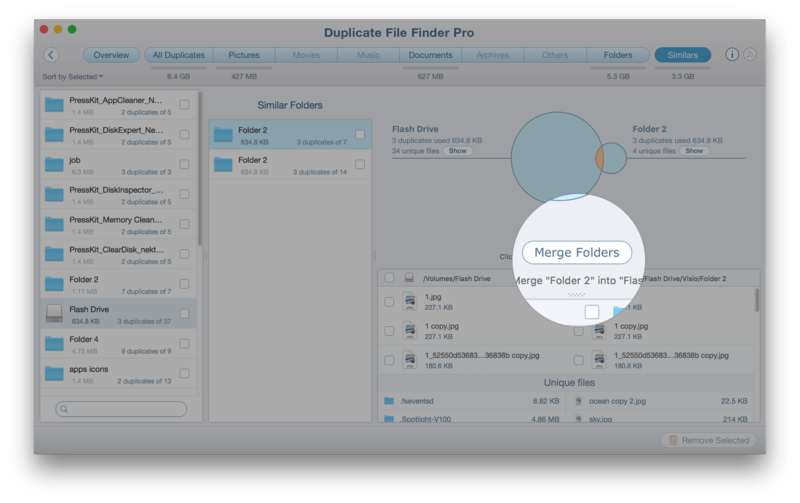 For example, sort your duplicates by size and first remove the biggest files. Or, if you know the name of your duplicates, sort the files by name and quickly get rid of them. 4. Skip the scanning of some folders. If you open the app’s Preferences, you will see the Skip List tab. Here you can choose which folders, files and extension types which the scan should skip. 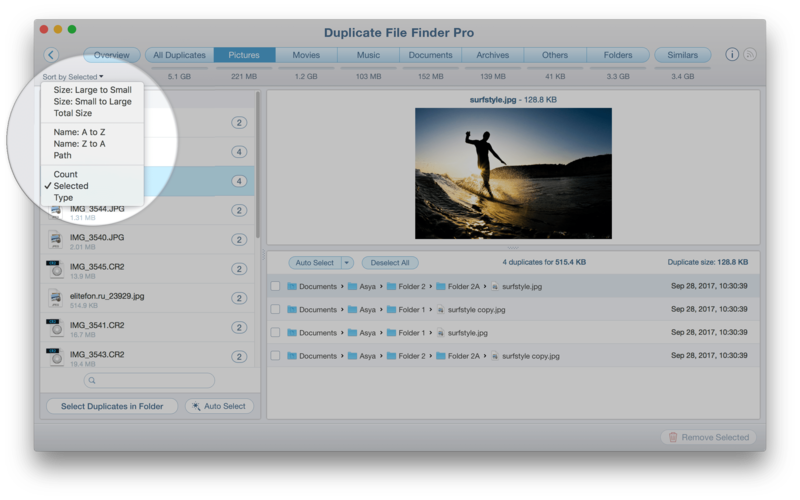 As a result, you save time as you scan files and select duplicates from hundreds of duplicate items. Note, if you change the Preferences, they will work with the next scanning assignment. Note: if you are not sure about your folders’ content, you should review the selected duplicates before deletion. The application doesn’t delete any file without your confirmation. It is an obvious option, so be attentive to this popup message. Nevertheless, if you have deleted files by mistake, don’t worry. That is understandable with many of our users, so when you delete duplicates, by default the files go to Trash. If you need to recover your files, just go to Trash and use the Put back command from the context menu. At the same time, note that this option can be changed in the app’s Preferences. If you want to have the possibility of recovering files from Trash, do not change the default settings. 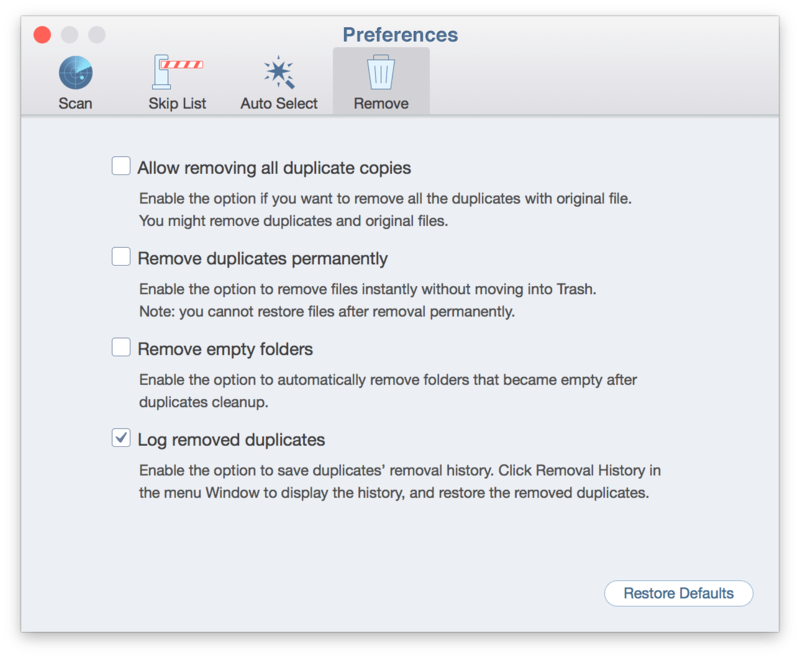 If you want to remove duplicates permanently and skip moving the files to Trash, tick the appropriate option. And one more important point to note: if you remove duplicates from an external drive, you should know that the files go to the Trash of this drive, not to the Trash of your Mac operating system. That means that the drive needs to be connected in case you want to restore the deleted duplicates. If you have a big number of duplicates, it might take a significant time to review each file and select unneeded copy in a specific folder. That’s why the application provides a special feature, which will help you to complete this task much faster. Click the Select Duplicates in Folder button. You will see a new window with a list of your folders and detailed information about how many duplicate and unique files each of them has. Mark the folders in which you want to select the duplicates and click to remove them. This option would be helpful for you if you need to quickly organize your files and folders that have some duplicates and some unique items. When you merge folders, the application moves or copies unique files from one folder to another. As a result, you get two duplicate folders so that later you can just remove an extra duplicate folder. The application has a well-deserved popularity among Mac users with an average review rate of 4.5 in the App Store. Here is what the users say about their experience with the application. This app is incredibly fast… I ran it against several other well-reviewed competitors and it just blew them out of the water. Scanning two terabytes of photos, files and movies, it found everything in seconds, while the best of the other lot was still working on it after several minutes. Pretty remarkable actually. Also, it’s sorting capability is next to none. Great user interface, clear concise and thorough, leaving mystery out of the equation. I’ve been working on this project literally for years – collecting files off old hard drives, CD’s, memory sticks and phones … I finally have them now, and now what? Well, I thought, the first thing is to remove all the duplicates. And how am I going to do that? This app is a godsend. Excellent job. Oh, and the best thing is being able to try it out before paying. Any app that wants me to pay first, I don’t even bother about. This app is easy to use and has helped me so much! I’m personally not the best at keeping my files organized, but this saved my bacon! I really like that you can scan multiple folders against each other. This is really helpful for me because I scan my hard drive and my SD card at the same time to see if I already transferred everything! Fantastic! Worth the money! 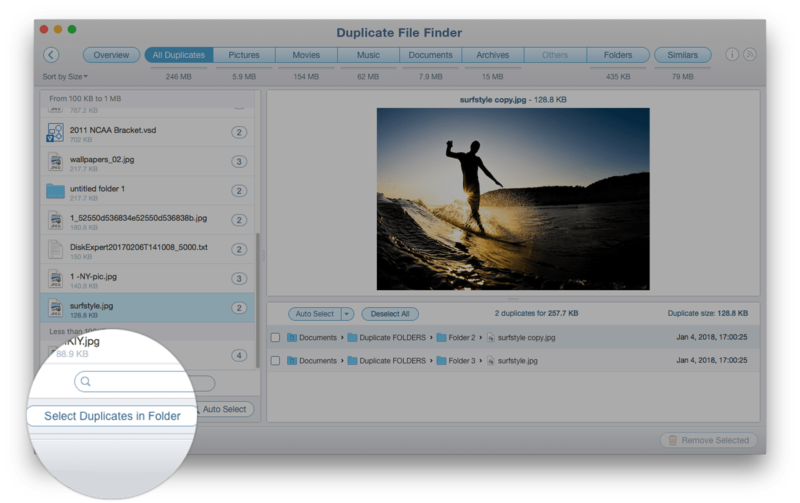 Download Duplicate File Finder and get rid of useless data on your Mac!